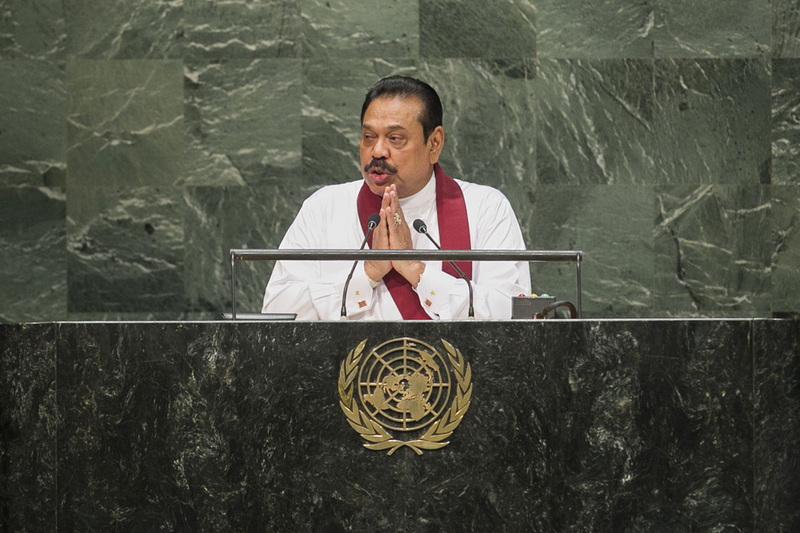 MAHINDA RAJAPAKSA, President of Sri Lanka, noting progress made towards achieving the Millennium Development Goals, said that multiple challenges still remained. Pointing out that reducing inequality within and among countries was one of the most transformative goals proposed by the Working Group on Sustainable Development Goals, he expressed hope that that would enhance the voice and representation of developing countries in decision-making. The post-2015 agenda must focus on implementation, ensuring that the failure of the developed countries to fulfil Millennium Goal 8 for a global partnership would not be repeated. Countries must be able to set their own domestic priorities, he said, backed by strengthened partnerships that would allow countries of the South to access to financial and technological resources essential to capacity-building. Structural obstacles and political barriers, such as unfair trade practices and investment rules, must be addressed to create a supportive international economic environment, enhanced investment flows and an open multilateral trading regime. The United Nations role in advancing international peace, security and prosperity crucial to the contemporary world, he said, stressing the need for consistent standards to gain the confidence of the entire international community. Post-conflict Sri Lanka had fallen victim to the ill-conceived agendas of some in the Human Rights Council, who disregarded progress made by his country, in contrast to their response to disturbing humanitarian emergencies elsewhere. The Organization’s systems and mechanisms must be de-politicized, he said, urging concrete results on Security Council reform in 2015. Noting with distress the increasing violence in the Middle East, he expressed support for an independent, viable State of Palestine. He also pointed out the need for solidarity between Asia and Africa, stating that Sri Lanka was reaching out to countries in Africa to exchange knowledge and expertise. He urged the international community to support the eradication of deadly diseases in the continent. Concerning terrorism, he affirmed his support for all multilateral efforts to counter it, and looked to the early finalization and adoption of the United Nations comprehensive convention on international terrorism. Despite the effects of terrorism, he noted that Sri Lanka had achieved most of the Millennium Development Goals and was ranked ahead of all South Asian countries in the 2013 Human Development Index. The National Development Policy was rural-centric and had resulted in 7.8 per cent growth in GDP and per capita income of $3,280 in 2013. The country’s “IT” literacy had also grown steadily. Large-scale post-conflict reconstruction was under way with rehabilitation and resettlement initiatives implemented in the North. Importantly, elections had been held to the Northern Provincial Council after a lapse of 28 years, upholding the democratic tradition in Sri Lanka, which had been protected since independence.